Where is Artificial General Intelligence? Though most of my career in inventory analytics has dealt with package goods categories, I also studied and applied softlines inventory science. Softlines are goods categories, like clothing, where the introduction of new styles are highly cyclical, and old inventories are often marked down to make way for new style goods. The timing and depth of markdowns are often key decision variables. Its a classic place to use quantitative methods to improve profit and reduce waste. A Forrester blog innovation survey. How much time do you spend on business innovation? It will be interesting to see the results. In eCommerceTimes: A look at new content marketing. Video is getting more powerful as a tool. We have seen this for some time. The more attention gathering, the more likely the connection. Video, though is still an unstructured medium, and needs adequate text and tagging support. What is the value of radical transparency? " ... Radical transparency, the idea of everyone knowing everything, could actually be a major driver of increased organizational performance. Private research software firm Qualtrics believes that the biggest reason companies fail is because people lose focus and get off track. It's particularly true of young, fast-growing companies driving to meet stretch revenue goals and keep their investors happy. Qualtrics didn't want to fall into that trap so the company made the bold decision to make all employees' performance data available to everyone in the company. By doing so, Qualtrics removes the distractions, fears, and negativity that sap concentration. The entire workforce has access to a host of information about the performance and practice of each employee that includes. ..."
Is the mouse facing extinction? Its now more about touching a screen but the finger is still too big, and we still want partial touches and hover-overs as an alternative to click through. Recently brought to my attention again: Roger Martin's 2009 book: The Design of Business, Why Design Thinking is the next competitive Advantage. It has bee on my list for a long time, but forgotten. Chapter 4 : Transforming the Corporation The Design of Procter & Gamble. This details the addition of formal design functions to P&G. I was there at the start of this process. I am a big believer in design processes. I am less certain the the same design skills that can be used to design products can also be used to design or design re-design corporations. Corporations survive and thrive via their monetary interfaces, not their external design appeal. More to follow as I review. I no longer have a book budget, so if you would like a book mentioned here, send it along to me. With 6,234 stores in 13 countries and annual sales of 72 billion pounds ($116 billion), U.K. retailer Tesco is well established in the global marketplace. But until recently the supermarket chain operator only sold to consumers on the web in its home market of the U.K. .....Tesco, No. 3 in the Internet Retailer Top 400 Europe, took its first step into selling goods electronically in 1984 with a service that enabled registered members to buy a limited range of products via a television interface, Sam Hill, lead solution architect at Tesco Plc., told attendees at the e-Commerce Expo in London this week. On Gamification in Business. Have been involved in conceptualizing and delivering several of the these projects. None were a complete success. But the metaphor is worth thinking about. An HBS Working knowledge piece on Tips vs bribes. Which reminds me of early training in this area. always saw the training as very well thought out, but always wondered about it in practice. Never had to apply it directly. Testing flavors online .. Not quite what it seems reading the headline. Reminds me of our own digital scent work. True virtualization of non-sight sensory interaction at a distance will be a big deal. Via Gib Bassett On the emerging big data ecosystem. An interesting way to think about it ... because ecosystem implies active and important interaction. Barry Devlin writes: " ... All of this leads to a new architectural picture of the world of data--an integrated information platform, where we deliberately move form a layered paradigm to one of interconnected pillars of information, linked via integration, metadata and virtualization. A more complete explanation can be found in my white paper, "The Big Data Zoo--Taming the Beasts: The need for an integrated platform for enterprise information". ... "
We brought in Michael Scott Morton emeritus prof at MIT, to help us start the process of EIS. I was reminded of this by colleague Michael E Doherty. Will follow with more here. Good non technical article in The Atlantic, An issue we talked when considering the AI enterprise. Robots already take a significant portion of manufacturing jobs. What if intelligent machines take over a much larger portion of work needed? Will it become just cheaper goods, or will we become slaves to the machine? Or are we already? On what Xerox spinoff Parc learned about open innovation. We visited Parc many times and they us, always interesting. " ... The concept of open innovation has moved from business phrase to business reality over the last ten years. When PARC became a for-profit subsidiary of Xerox to practice open innovation in 2002, Henry Chesbrough had not yet published his book Open Innovation and the concept was not well understood. Companies knew how to engage a design firm, license IP, and form joint ventures, but few knew how to truly co-develop innovations with external partners, such as PARC. ... "
We we were taught the exercise of building a personal brand in the Enterprise. At very least the exercise itself has value. You could even build a blog to do this. Interestingly thoughts by Stephen Few. On the use of dash board displays for control. Dashboards are just simple displays. Like the article says, at best an illusion of control. He uses a term I have never heard before which is telling: 'idiot lights'. I have many close watchers who have noticed this blog has been dark for several days. This is the first time this happened for years. A number of people noticed and expressed concern. It turns out I was attending the Recordedfuture conference and a consulting meeting with a US Inspector General. I was struck seriously ill and due to heroism by several people I came through this . I remain for now at John Hopkins /NIH where i have learned new things about health data and MRI images. plan to continue to provide information in this place. More too about my perilous experience and it's place in mobile health delivery to come. Every life experience is a learning experience. Are Tweets data? In GigaOm. With the increasing use of tweets the need for real-time analytics is happening more, I recently did an evaluation that dealt with the twitter firehouse, and this can be a daunting task. An article and video. Connecting methods to provide forecasts. Forecasts based on semantically rich text data, such as that based on blog entries, news posts, or tweets. Today I met Brand Niemann of the Semantic Community at the first Recorded Future users conference, who informed me of work going on that has successfully connected semantic forecasting methods like RecordedFuture and the data visualization package Spotfire. See the link above for the detailed example. For a broader view of the conference see my tweet stream at #rfun2012 . A number of sites to watch that deal with the topic of big data. lots of hype of late, but the topic needs to be watched as techniques evolve. MIT newest research center will focus on mobile technologies. More here. Also known more formally as the MIT Center for Wireless Networks and Mobile Computing, the new organization pulls together more than a dozen MIT professors and their research groups to work on next-generation wireless networks and mobile computing. The work done at the center is designed to make an impact on technology users: Wireless@MIT trumpets a "strong industrial partnership" with Microsoft, Cisco, Intel, Telefonica, Amazon, STMicroelectronics and MediaTek -- and says it aims to influence standards and products. In GigaOM : this was brought to my attention as I started my own small pilot of the Square payment method for some kinds of consulting work. So far it has gone well, though I did note that were some issues reported around doing payment returns. Also the hardware looks flimsy for heavy use. Apparently the NYC group want to experiment with other hardware. Will follow this. Adage on the obsolescence of cash. I am convinced it will happen, especially if convenience incentives continue to grow, and are provided in exchange for elements of engagement that retailers and manufacturers will provide for deeper shopper understanding, Cash will remain for some time to patch the gap. On Group Intelligence: In the HBR blog network. Collective intelligence is a complex issue. It clearly deals with IQ and social aptitude. " ... work is nearly always a team activity, and often those teams are embedded in ever-shifting networks. A new field of study, collective intelligence, is measuring the ability of teams to solve problems. This research is yielding powerful insights into improving the performance of networks, teams, and other collective groups. One breakthrough finding shows that collective intelligence is variable and measurable and — most surprisingly — correlates more with the social abilities of the team members than with the team's aggregate individual IQ. ... "
The EU's human brain research simulation project. Have seen a number of attempts to do this kind of thing. None that have made significant progress that I can see in the sense of producing intelligent thought, except in the most narrow of domains. This example is another one that attempts to simulate biological brains: "... The computing power needed to build the model is phenomenal. Simply to replicate one of the 10,000 neuron brain cells involved in the rat experiment took the processing capacity usually found in a single laptop. To simulate a fully functioning human brain, it would take billions.Hill says that such computational power -- known as exascale -- will be available by the end of the decade. The Human Brain Project's scientists are hoping to work with supercomputer developers to ensure future machines match their requirements.... "
Doug Lautzenheiser's tips for success. Do predictive analytics with big data. He as a seasoned data practitioner and has some great analysis and advice. Further I think we have the data and the tools, though I think they need to be better integrated for the decision maker. And more integrated visualization, please, to make convincing arguments for the results. In GigaOM: A good case is made that the 'bigness' of data is often not enough. In addition, I add: Bigness means you can often find patterns that will be useful to the enterprise. Diversity helps to make the results significant and applicable to multiple problems. Fast means you can apply the solution to the our faster, mobile and complex world. In a recent client application we saw how the commonly available weekly data would not support the need to make quicker decisions. Diversity means you can include contextual external data that was in the past considered unusable. Bring it all together and you have a more robust solution. Make it more likely you can be disruptive in your data application. Ever since several trips to Japan and their wonderfully complete universal vending capabilities. 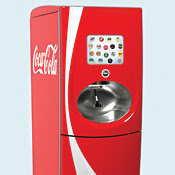 I have researched the use of vending machines and their integration with data streams. Which can be used to indicate demand and supply requirements. Even communicate back to headquarters. Here is a recent outline, incomplete, but an interesting overview of interesting vending ideas. The hugging machine is interesting. On the right is the Coke Freestyle machine, a great example of late stage product differentiation, now fairly common in the US. I see there is a good technical description here. An article called Why Creativity is the New Economy led me back to the blog and site: Visual Mapping. A favorite topic. We are all visual thinkers. Visual thinking is a kind of story telling. It links pieces of information into a thread that can be more readily constructed and remembered to document knowledge. Today we can use these constructs in digital form to link to working process and analytically find better solutions. Part of the creative process. In AdAge: Many companies do this, but the details are interesting here. Create a near real time interaction with flows of data. Visualize and mine it to make mid-course corrections in tactics. And most importantly, respond to the chatter as it occurs. " ... Procter & Gamble operates what they call the "Tide Newsdesk" to rapidly respond to social media chatter, says Global Brand Building Officer Marc Pritchard. One notable effort took advantage of NASCAR workers using Tide to clean up a fuel spill at a race, and it resulted in 350 million impressions. The Newsdesk also allows the company to handle missteps, such as in a poorly received Pantene push.... "
UPDATE: I have now seen the list pf participants, and this will be an exciting and informative local meeting about the topic. Meet a number of local practitioners. Will include a talk by Glenn Wegryn, former head of analytics at P&G. Also a sports analytics expert who works with the Cleveland Indians. Sign up now at the link below. Analytics In Action: What do Jeopardy, Pampers and Major League Baseball have in Common? A number of my former colleagues will be presenting. From the UC Center for Business Analytics. Headed by Geoff Smith, P&G Alumnus. A European colleague sends this piece about acoustic bar codes. It is a hack, but I like the idea of being able to interact with packaging or display via a touch interaction and then getting the same information you would get with visually scanning a bar code. Adding a sensory dimension has potential value. An example of augmented reality shopping by Junaio in Cover magazine. A physical publication. See it and try it here on Facebook. An early example of advanced interaction with a magazine, but could as well be packaging or store signage. On a poster or built into a wall itself. I was just reminded that it has been about 60 years since the patenting of the bar code. See this BBC article. Today we think of it as a very humble thing, but it was the first commercially successful attempt to convert the physical into the digital. This created all kinds of leveraging capabilities that we had not seen before. Making shopping, interacting with and shipping products much more efficient. It has also led to richer and more transparent data that created better analytics. A transformational event. IEEE deconstructs and compares recommender systems. " ... By now, online shoppers are accustomed to getting personalized suggestions from the sites they visit. Amazon compiles lists of books we might like. Netflix suggests videos to watch. And Pandora builds personalized music streams by predicting what we’ll want to listen to. Recommenders, which started as relatively crude and often inaccurate predictors of behavior, are now extremely sophisticated systems that often seem to know your tastes better than you do. But how do recommenders work, exactly? Two researchers who’ve been building and analyzing these systems for nearly as long as they’ve been in existence explain how companies size you up and try to match your tastes to those of others. .... "
In CGT: Unilever seeks technologies that will support sustainable growth. " ... Unilever put out an open call for cost-effective innovation on three technical challenges it wants to solve to meet sustainability goals: It is looking for an environmentally friendly way to break down fat deposits on clothes and hard surfaces, a way to reduce sugar by 30% in ready-made tea without affecting taste and a water-soluble way to stabilize natural red color used in fruit and dairy in a cost-effective manner throughout shelf life. The company put out the call after the success of an online platform launched in March to seek submissions for other technical challenges ... "
In CIO Insight. Lots of groups are seeking to insight out of social. Many with very great expectations. News from Oracle OpenWorld. Drilling for insight is the new Oil. But be sure to keep your expectations focused and business oriented. I often have to explain analytics and modeling to people. Just today I had a meeting with a client who needed to understand the value of analytics and modeling beyond just extracting and visualizing complex data. The presentation needs to be adapted to the audience and their needs. Simple is always better unless you are talking to academics, This recent piece from the SAS Blogs by Alison Bolen presents some good thoughts about the process. From IdeaConnection: Good piece about how Iconic toymaker Lego uses open innovation. " ... Lego is an open innovation pioneer, one of the first companies to develop practices and platforms to engage external contributors to innovation processes. Being open to the ideas of others has helped to transform the company’s fortunes. ... "
In CW World: I have always thought that search engines did a poor job of internal search. In particular they have not taken advantage of internal knowledge structure that naturally exists within an enterprise. The piece also includes some interesting statistics about the use internal search. It pays to make it much more efficient and especially accurate. "... We're proud to announce that the Tagwhat iPhone app has reached #22 in Travel in the iTunes App Store. Additionally, major updates to Tagwhat's on-line publishing tools and mobile application for iPhone and Android. How many clicks does it take to deliver rich web content to any spot on Earth in Tagwhat? Oh, about three or four. Tagwhat's new 'Tag it' button is a simple bookmark for your web browser. Click on it as you surf the web, and the media you find is quickly directed to the real world places you choose. Get your Tag it button free at http://publish.tagwhat.com and start creating a mobile tour with your favorite content in no time flat. McKinsey report on a survey done with executives. Registration required for full report. " .... Executives say their companies use multiple organizational approaches to drive innovation and that the success of these efforts depends on integrated strategy and C-level support. These are among the findings from our latest McKinsey survey on innovation,1 which asked executives about the organizational innovation structures in place at their companies, the strategic and financial objectives these structures have set, and the people and processes involved in achieving innovation outcomes.... "
I have given a number of talks on the use of gamification for both internet and productivity engagement. I did receive some interest on the topic. I see here a link to the final review of a Coursera course on gamification, which provides a good overview to the topic. No frills or visual details, which I assume would have been provided in the full class. I have been taking a look at alternatives to the mouse for computer interaction. Came upon report of work by Microsoft labs doing 3D gestural had interaction work. Here in Engadget. So will mouse interaction be replaced? Includes a picture which shows that the Kinect-style approach is still in early prototype. Information Week on multiple government big data initiatives. And you can add another, the DARPA xData initiative. " ... A trio of federal agencies is looking to engage the American public to garner ideas about how to best utilize the massive amounts of data housed on government servers. NASA has joined forces with the Energy Department and the National Science Foundation to launch "The Big Data Challenge" -- a series of four contests, beginning with an "ideation challenge" designed to find new tools and methods for analyzing unique data sets ... "
A 74 free e-book. Registration required. There is much confusion on this topic. This is a good overview with relatively little obscuring complexity. In PopAI: More on Peapod's Virtual stores, including a good video of it in operation. " ... The campaign stretches all across the U.S., littering 100 subway stations with digital billboards mimicking mini-grocery aisles displaying up to 50 products, each complete with a picture, price, and an easily scannable barcode. Once the barcode is scanned using the shopper’s smartphone, the product is then added to their Peapod list.... " This is a good idea, in focused, limited areas. The same displays could also be put on tablets to make shopping for commuters even easier. Note the direct mimicking of a retail shelf. This approach has not been particularly successful on the Internet in general. Would it be any different in this environment? We expected Artificial General Intelligence (AGI) to follow quickly when we formed an artificial intelligence team and lab in the late 1980's. Surely once we started to build incremental intelligence into the expert systems of the day they would soon be interconnected into 'general' intelligence that would guide the enterprise forward. Yet that did not happen. Five years later our AI team was disbanded. Despite some successes, they were all in focused, limited domains. We invested in companies that looked like they would become giants of AI, like Teknowledge. But these companies also soon sank into limited domains. Even successes like IBM's Watson are mashups of the ideas we used then. What happened? Why have there been no advances for AGI in decades? Discussed in Kurzweil AI. Good thoughts. One answer: The hardware has not caught up yet. Despite all the suggestion that the brain's neural methods would soon be replicable, it has not happened yet. I have used IThoughtsHD for some time as a mind mapping tool. The main reason for choosing it was that it was usable as an iPad App and could readily communicate with other concept mapping formats. Mind/Concept Mapping is an excellent application for tablets. These are very useful for constructing a map of a client process, presenting and editing. Most recently IThoughtsHD has added a way to extract topics from Wikipedia and other online resources to establish topics and gather descriptions via online research. I have found it very useful to rapidly construct outlines for research. A video demonstrating the approach. An example of unappreciated genius. Nikola Tesla. Wireless and energy transmission pioneer. I have seen the ruins of his lab from afar. I have stayed in a room on the NYC New Yorker hotel, close by the room he lived in until his death. Now his lab and its grounds have been acquired by fans and a museum is planned. And more. SAP's Creepy New Retail Software Uses Big Data To Make You Buy More Stuff. Tailoring promotions to mobile shopper needs in the store. Predicted it was inevitable. We have thought about it for a decade. Though have not had the chance to take a closer look yet. While the article call's it creepy, it is an inevitable outcome of more data and more precise and timely data available. Consumers come into the store armed with devices and retailers will have the ability to better feed them with products that suit their needs. It is indeed the long expected 'virtual salesperson'. More interesting yet will be the data that comes back from the devices, the analytics that includes the shopper behavior of buying choice.
" .... SAP's product is a new implementation of its upcoming NetWeaver Cloud called SAP Precision Retailing that uses the consumer's location, social profile, needs and the time at which they are conducting their business to generate relevant content (including discounts and special deals) designed to get that particular consumer to make the purchases the retailer desires. Technology, then, as virtual salesperson.... "
More on SAP Precision Retailer. Which they say aims to Deliver personalized shopping experiences that drive revenue growth and inspire consumer loyalty. An example of using 3D printing to create simple displays and sensors. " ... Aside from simple displays, the process can also be used to produce a variety of sensors, using changes in a path of infrared light to detect movements such as the touch of a button or the turn of a dial ... ". Packaging might also be an obvious direction from this work. This press release recently came up in some research " ... Tibco Spotfire Announces Expanded Partnership with Teradata to Offer Extreme Data Discovery and Analytics ... Spotfire Harnesses Teradata for Executing Complex Calculations and Predictive Analytics In-database ... " I brought in and used Spotfire in the Enterprise in 1997 soon after its founding. Always impressive capabilities. " ... Spotfire's origins trace back to the Human-Computer Interaction Laboratory at the University of Maryland, College Park where, in the early 1990s, Christopher Ahlberg, a visiting student from Sweden, worked with Ben Shneiderman ... " I note that Christopher Ahlberg, one of its founders, is now CEO of RecordedFuture, and is still a correspondent with me on advanced forecasting methods. Which I frequently write about here. Correspondent and frequent consultant to our enterprise Jerry Michalski gives his first talk at TED, in Copenhagen. On education on trust. In CWorld: Augmented Reality Accelerates. I visited a lab this week that was building novel augmented reality work for local enterprises. More specifics on that later. The empowerment of the shopper has heightened the interest for new ways to improve the experience. Take a look at Procter & Gamble's Connect and Develop Website. " ... This site has been created to help external innovators and companies learn how Connect + Develop SM works. Here you can read about our past successes, our current needs, and what we look for in an innovation partnership. And if you are the owner or representative of an innovation that might help improve the lives of our consumers, this site can help you to reach out by submitting your innovation for review by our Connect + Develop SM Team..... "
Google has long been known for working on techniques that allow the automatic analysis of unstructured data like images and video. A classic element of human intelligence. Here is more on what they are up to. It brings up new kinds of worries about privacy, but this progress is inevitable. An example of location enabled loyalty and payment in a mainstream mobility solution. We will see more of this on many platforms. " ... Starbucks said Thursday its mobile app and Starbucks Card are now integrated with Apple's Passbook, enabling users with iPhones running iOS6 to use their phones for buying coffee ... "
Innovators should Think like a startup, break some rules. " ... When pioneering new technology in an emerging industry segment, it's important to think outside the box by approaching innovation much like a startup would, according to OnProcess Technology's Robert Kenney. In a recent interview, Kenney said new market opportunities need to be treated with a different set of rules, and existing players accustomed to operating in an established environment need to be willing to get "more aggressive" when targeting new business.... ."
Article in IEEE Spectrum: On rethinking the factory worker. Quite a coup if it works. And would be quite a worry to employment if it does. I still have my doubts that all the contexts of labor can be adapted to. Still a step forward to be watched. See also Rethink Robotics. " ... Baxter, an industrial robot from Rethink Robotics based on the vision of Rodney Brooks—possibly the world’s most celebrated roboticist—makes its debut this month. Brooks, who is also the start-up’s founder, chairman, and CTO, is optimistic that Baxter will unleash a revolution in manufacturing because of the many ways in which it is unlike any other industrial robot. Its two arms, each with seven degrees of freedom, don’t move with superhuman speed and precision. But the machine adapts to changes in its environment, and can be programmed to take on a new task by a person with no robotics experience. And while a traditional two-armed robot, including sensors and programming, will typically set you back hundreds of thousands of dollars, Baxter costs just US $22 000.... "
The below requires registration, but I found it useful. In a recent survey from eBizQ, nearly two-thirds of business and IT professionals are currently using or considering, decision management technology and complex event processing (CEP) tools. When leveraged together, these two disciplines provide a competitive edge to an organization – providing constant access to operational information in order to react quickly to marketplace changes. Combine these two disciplines with predictive analytics and companies can move toward real-time responsiveness to both opportunities and threats. Good piece in Consumer Goods Technology about the new and growing relationship between PLM (Product Lifecycle Management) and innovation. How it can help retailers to innovate faster. We also looked at how to link beauty to digital technology, this is an interesting play. " ... L'Oréal Seeks Women in Unlikely Place: On Xbox ... Beauty and Style App Is Console's Latest Effort to Reach Audience Beyond Core Gamers ... "We are leveraging Xbox for what it is becoming, an entertainment device," said Esohe Omoruyi, VP-digital marketing, L'Oréal USA .... "
An overview of a recent survey on how shoppers use online price comparison before buying in-store. Covered broadly in the news. Proof of concepts developed to use smartphone cameras for remote spying via malicious Trojans. Not an unexpected capability. . And the camera is only one sensor loading of a very common device. In Fast Company: Good overview of the need for mobile strategy. Also some excellent examples to consider. I have found that a coherent strategy for small companies, and even some larger ones is uncommon. Sitting at a Panera yesterday at two separate meetings, and at a talk I gave this week at Xavier University, surveying mobile usage in those locations made it clear that both workers and customers continue to embrace moving connections. Businesses have to be there in planned ways. Supplemental therapy Apps. Which reminds me of the time in the 1990s when AI based psych therapy programs were much discussed, but were soon seen to be less than serious and vanished. Quite a rich resource of data mining ideas and useful articles. Points to a number of directions that are worth following. In Mind Hacks: A telling piece that critiques a study relating the speed of drinking to the shape of a glass being used. An excellent caution. Classic example of behavioral cause and effect assignment. Having supported and produced research that deals with the analysis of human behavior, this is the first caution of any such study. In the HBR Network: Great video on the juggling of priorities. Often a dilemma. In my experience priorities are always determined by context, which is always shifting ... so you always juggle to some extent. But can you? A move forward in 3-D printing. " ... Want a new part for your synthesizer? Need a replacement knob or dial? In a first, one company is telling its customers to just print their own. It’s a move that signifies a major step into a new commercial marketplace, where customers can buy products directly from companies for on-demand, at-home manufacturing. And while we probably won’t see complicated, mechanical products from big corporations reaching us through Thingiverse for a while yet, knobs and dials are the perfect static, detachable objects to begin the movement. ... "
Again I think there is still some issue with doing this for all but the simplest parts, the service could be moved to the obvious players, like Kinkos, which could have the machines and raw materials available on demand. Expect it to be more common. DARPA's pack mule for the soldier is getting closer to reality. Saw some early tests in robotics exhibitions but wondered if it would ever be used. Expect the appearance of other forms of walking drones as well. An interesting piece from Paul Barsch. Via Gib Bassett. Intelligence and its integration used to be a function that I worked in, so it is intriguing to see this connection made. " ... Regarding the Al Qaeda terrorist attacks on 9/11, it’s distressing to discover there were plenty of chances to stop them. Read on for three lessons learned from 9/11 that can be applied across today’s enterprises to promote better analytics. ... " Excellent points mentioned, have seen them all in the big enterprise and government. I had a conversation just the other day with an enterprise center manager. Ever since the emergence of mobile, the complexity of issues like data security has expanded far beyond the underground bunkers. Just recently the issues of Clouds, Software as a Service, handling big data and delivering that data to multiple un-controlled mobile platforms have made the problem yet more complex. Discussed and visualized in Baseline.